Damsons were a wash out this year, none whatsoever. By contrast the previous year we had the usual glut with drunken wasps and a fruit loving fox eating them off the lowest branches. Purple scats everywhere. That was the summer I started my wine making: bilberry, blackberry, strawberry, hawthornberry .... I gave them all a go and with mixed results. I expected bilberry to be my favourite, the Rolls Royce of wild berries, but sixteen months on and it’s still got a fizz to it. Damson was the best of the bunch. When I explained to Sue that I was going to give some wine to our neighbours for Christmas she asked what did it taste like? Her verdict was cough medicine but I felt sherry was kinder. 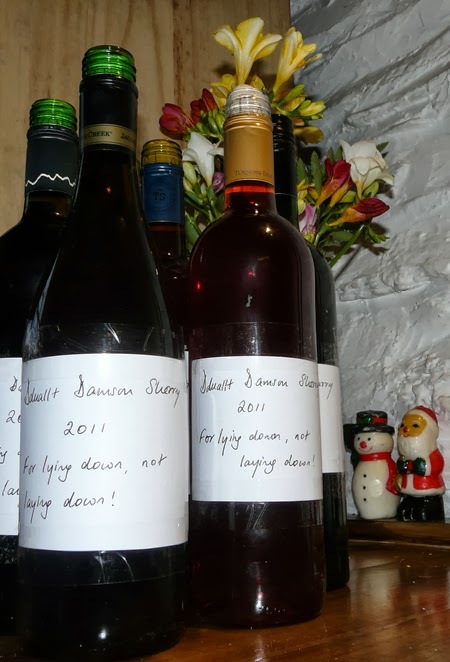 So that’s what went on the labels ‘Dduallt Damson Sherry 2011’. Our neighbouring farmer consumed his bottle that first night and has declared it a fine potion needing but two paracetamols. That’s good enough encouragement for me to try again next summer. Let’s hope for a better growing season.